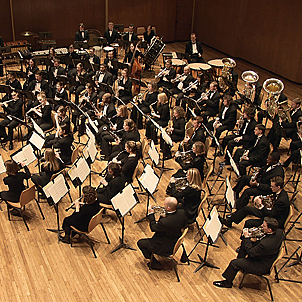 Comprised of approximately 60 undergraduate and graduate students who have attained the highest level of proficiency on their instruments, the Wind Symphony is the premiere ensemble of the University of Illinois band program. Performing the finest available repertoire, the ensemble's performances include traditional wind band literature, one-per-part chamber works and premiere performances of new compositions in the ever expanding wind band genre. The ensemble works on the flexible "pool" concept so that each work in the curriculum is staffed with the instrumentation envisioned by the composer. The Wind Symphony performs a minimum of three concerts per semester, and has the responsibility to lead the band profession in performance standards as well as creatively developing the future in training wind players in a variety of conducted ensemble settings. The performance range of this ensemble includes campus, state, regional, national and international events and venues. The Wind Symphony is open to music majors and non-majors by audition.